A discipline between Wolf Parade members is their shifting nature to switch from project to project, bringing considerable bravado to their separate outfits. When it’s time for the so-called Canadian “supergroup” to shift gears into compromising territory, the results have always turned out to be surprisingly cohesive. There’s hardly a noticeable imbalance of creativity between Dan Boeckner and Spencer Krug’s vocal and artful interjections. In Expo 86, Wolf Parade sound placid and content in collaborating to a fuller extent without ditching their expected interplay of guitar staccato techniques and synthesizer pulses. 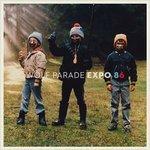 The fast-paced, energetic pacing of Expo 86’s knit together compositions demonstrates their looser, celebratory nature. The thumping drums of album opener Cloud Shadow of the Time detonate without an intake of breath, serving as a centerpiece to introduce the textural synth partitions and guitar chord plays that surround the entire production. Facing inevitable line-up changes, the musical kinship remains interconnected but not chained to regression, which shouldn’t deter those who have appreciated the group's escalating progressive tendencies. Without a doubt, Expo 86 is an uninhibited, guitar-based rock album, boasting heavy electric instrumentation and a voracious appetite to leave the speakers vibrating with force. In What Did my Lover Say (It Always Has to Go This Way), Krug readies some histrionic guitar dynamics, shredding to the steady pace of a marching parade as the strings glisten with clarity. Boeckner isn’t a slack either, bringing an invigorating anthem that recalls British Sea Power’s last excursion into more radio friendly territory. Interestingly enough, this new approach stands on democratically equal footing - In Direction of the Moon’s escalating jam is fit for stadiums, just as the intimate anecdote of picking your lovers all apart in Palm Road is adequate for indie pubs alike. A minor detriment to Expo 86’s striking, guitar lashing is its same-y nature, especially evidenced in how the synth fluctuations play like afterthoughts to the already complex compositions. Part of the reason why Apologies to the Queen Mary remains in the memory of many is due to how the synth work (which was far more inventive in past albums) was always at the forefront, as if the songs themselves were built upon those peculiarly eccentric touches. The slick, new-wave inspired aesthetic of Oh You, Old Thing recalls some of the cheesiness on which Boeckner based his Handsome Furs project. Even so, this is still the sound of a guitar band getting its synth on but maintaining its musical identity. Brimming with ideas, the haughty arrangements in Expo 86 come out as heavy handed at times, especially when the hefty running time leaves ample room for excess. However, it authentically bares its skin with nostalgic affection, bringing together four musicians that get together from time to time and remember the enjoyment of creating by way of impulse. When Yulia’s romantic stroll through memory lane plays, a remembrance to Wolf Parade’s naïve heyday is restored, as if one were listening to I’ll Believe in Anything’s enchanting melody for the first time. But just as one leans on nostalgia, Expo 86 emphasizes the fact that novel beginnings are meant to prosper whilst winking at the past from time to time. When you come back to it, it’ll sound sweeter than ever.